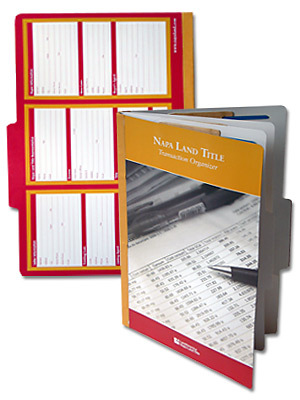 Classification folders, also referred to as Transaction folders, made from high quality, heavy duty materials provide a unique organization tool to keep track of ongoing transactions and constantly changing documents. Most classification folders are plain and utilitarian with no corporate identification or branding. Dataguide provides custom branded classification folders that stand out and provide a constant reminder of the services and products you provide. Plain colored classification folders are available from any office supply store, but if you use a lot of classification or transaction folders, branded folders are the way to go. In todays market you face a constant battle to keep your name and brand in front of clients and prospects, customizing and branding the classification folders you use every day is a practical and inexpensive way to achieve that goal. Business that can benefit from a branded classification folders include real estate / title and escrow companies, Medical offices and legal professionals. The exciting thing is , when purchased in quantity, branded custom classification folders are often less expensive than the plain folders you can buy off the shelf at the office supply store.